On this August “wintery, summer day”(as my friend, Bill referred to it), I decided to tag along with a couple of friends to the Alameda Point Antiques Faire. I didn’t make it down the first aisle before I spotted the first Trig&Polished Man of the day, Leandro Rosas. He was looking very stylish as he examined some trinkets at one booth. My eyes zeroed in on that handsome coat right away. A gorgeous navy wool coat with a wide collar and polished toggle buttons. Turns out, Leandro purchased that coat at the Antiques Faire just a few moments earlier. Being unprepared for the gloomy weather worked out for him because he acquired a gorgeous vintage coat, and that in turn got him spotted as one of the most stylish men there. What is it about men in wool coats? The magic of one garment completely trigging up an outfit. I think the magic lies in the details. The toggle buttons, the way the cut of a nice coat flatters a man’s build. 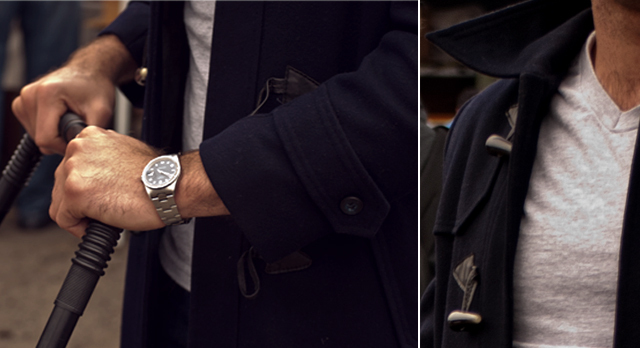 Toggle buttons make a coat seem well-crafted. Plus the buttons themselves are so beautiful. I decided to research toggle buttons for this post because as much as I admired them, I really had no idea what they were made of. Did you know that they are made from natural materials such as buffalo, cow or deer horns, bone, resin or wood? Talk about old world craftsmanship. I’m sure they have plastic substitutes but this being a vintage coat, you know it had to have been crafted from those finer materials. I bet that historically speaking, toggle closures were one of the first types of closures in tailoring. Alright, *Fashion History Nerding Out* aside, let’s get back to Leandro. He pairs the gorgeous navy wool coat with a slim silhouette of dark wash skinny jeans, a heather gray v-neck tee, and grey Chuck Taylor Lows. Oh, and I can’t forget to mention the stainless steel Rolex peeking out from under his left cuff. That’s one handsome outfit. Timeless, classic pieces mixed with modern cut denim. Simple mixed with elegance and neat all around. 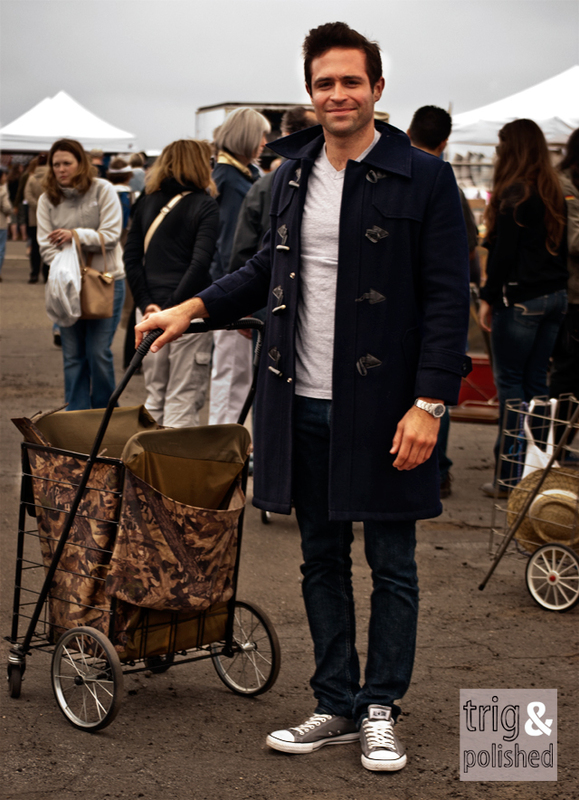 Just being at the Antiques Faire with his cart, which might I add is pretty stylish all it’s own with it’s tapestry lining ( I want one like that! ), shows that Leandro appreciates gorgeous things and is willing to do the work with the reward of finding unique pieces. Leandro loves menswear so much, that he even has a mens style blog in the works, called The Swagologist, which will focus on men’s style, fitness, and travel. He credits Tom Ford and Ryan Gosling as his style influences and likes wearing suits to work everyday. He gets his Tom Ford pieces tailored at Seymour’s in Union Square. So there you have it all you Bay Area Men, there is no excuse for ill-fitting suits. Leandro, here just gave away one of his style secrets. Go get your garments custom-fit! And don’t forget to check out Leandro’s site, The Swagologist in the future! Where he shops: Jeremys, Crossroads, Various Consignment Shops and Thrift Stores.